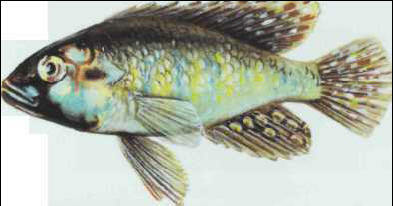 Burton's mouthbrooder is a species encountered in the Nile and East African lakes. It is more or less tranquil, but becomes territorial during spawning. The female lays her eggs in a hollow dug into the substrate and then incubates them in her mouth for 2 weeks in a secluded part of the tank. Size: 10-15 cm. УЭЛЛИНГТОН , столица Новой Зеландии; см. Веллингтон.